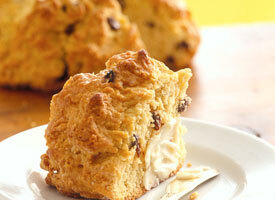 Whether or not you're Irish, this classic quick bread recipe brings great taste into your kitchen. 1. Heat oven to 375ºF. Grease cookie sheet. 2. Cut butter into flour, sugar, baking soda, baking powder and salt in large bowl, using pastry blender or crisscrossing 2 knives, until mixture resembles fine crumbs. Stir in raisins and just enough buttermilk so dough leaves side of bowl. 3. Turn dough onto lightly floured surface. Knead 1 to 2 minutes or until smooth. Shape into round loaf, about 6 1/2 inches in diameter. Place on cookie sheet. Cut an X shape about 1/2 inch deep through loaf with floured knife. 4. Bake 35 to 45 minutes or until golden brown. Brush with butter or margarine, softened, if desired. 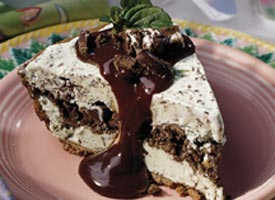 A chocolate pat-in-the-pan pie crust makes easy work of this special edition chocolate-plus pie! 1. Make Chocolate Pat-in-Pan Pie Crust. 2. Heat milk and marshmallows in 3-quart saucepan over low heat, stirring constantly, just until marshmallows are melted. Refrigerate about 20 minutes, stirring occasionally, until mixture mounds slightly when dropped from a spoon. (If mixture becomes too thick, place saucepan in bowl of warm water; stir mixture until proper consistency.) Gradually stir in liqueur. 3. Beat whipping cream in chilled medium bowl with electric mixer on high speed until stiff. Fold marshmallow mixture into whipped cream. Spread in pie crust. Sprinkle with chocolate. Cover and refrigerate until set, at least 4 hours but no longer than 48 hours. Store covered in refrigerator. Heat oven to 400ºF. Mix all ingredients until soft dough forms. Press firmly and evenly against bottom and side of ungreased pie plate, 9x1 1/4 inches. Bake 12 to 15 minutes or until light brown. Cool completely on wire rack, about 30 minutes. Need a little dessert to complete a fine dinner? Try a sophisticated bar that will pair nicely with coffee. 1. Heat oven to 350ºF. In medium bowl, mix 3/4 cup flour, the butter, powdered sugar and cocoa with spoon until soft dough forms. Press in ungreased square pan, 8x8x2 or 9x9x2 inches. Bake 10 minutes. 2. In medium bowl, beat remaining ingredients except whipping cream and chocolate sprinkles with wire whisk until blended. Pour over baked layer. Bake 15 to 20 minutes or until filling is set. Cool slightly; refrigerate at least 2 hours before cutting. For bars, cut into 6 rows by 4 rows. 3. In chilled small bowl, beat whipping cream with electric mixer on high speed until stiff peaks form. 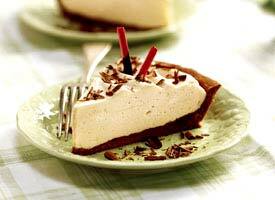 Spoon whipped cream into pastry bag fitted with medium writing or star tip. Pipe dollop of cream onto each bar. Top with chocolate sprinkles. Store covered in refrigerator up to 48 hours. Street food of India becomes a tantalizing food adventure in your home! 1. Heat coals or gas grill for direct heat. Mix all ingredients except chutney in large bowl. 2. Divide lamb mixture into 12 equal parts. Shape each part around each of twelve 6- to 8-inch bamboo or metal skewers, pressing the mixture with your hands to cover half the length of the skewer. 3. Cover and grill kabobs 4 to 5 inches from medium heat 13 to 15 minutes, turning skewers occasionally to ensure even browning, until lamb is no longer pink in center.4. 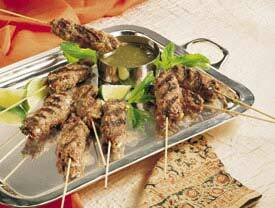 Serve kabobs as is or with chutney. Set oven control to broil. Place kabobs on rack in broiler pan. Broil with tops 2 to 3 inches from heat 13 to 15 minutes, turning skewers occasionally to ensure even browning, until lamb is no longer pink in center. 1. Place all ingredients in blender. Cover and blend on medium speed until smooth. 2. Tightly cover and store in refrigerator up to 10 days. It’s that meat-and-potatoes meal everyone dreams of coming home to. And now you can! 1. Mix potatoes, carrots and onions in 4- to 6-quart slow cooker. 4. 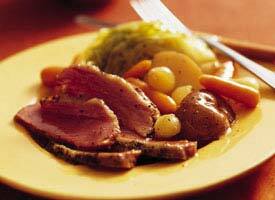 Remove beef and vegetables from slow cooker; cover to keep warm. Pour juices from slow cooker into 1-quart saucepan; heat to boiling. Mix cornstarch and cold water until smooth; stir into juices. Cook, stirring constantly, until sauce has thickened. 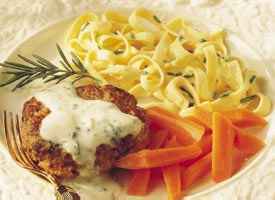 Serve sauce with beef and vegetables. Note: This recipe was tested in slow cookers with heating elements in the side and bottom of the cooker, not in cookers that stand only on a heated base. For slow cookers with just a heated base, follow the manufacturer’s directions for layering ingredients and choosing a temperature. 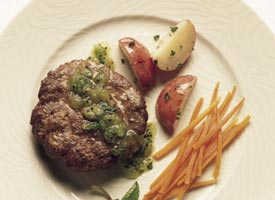 Broil ground lamb with a flavorful blend of spices, and top it off with a cool mint sauce for a fast, elegant meal. 1. Set oven control to broil. Spray broiler pan rack with cooking spray. 2. Mix all ingredients except Minted Kiwifruit Sauce. Shape mixture into 8 patties, each about 1 inch thick. Place patties on rack in broiler pan. 3. Broil with tops about 3 inches from heat 10 to 14 minutes for medium doneness, turning once. Serve with sauce. It’s your lucky day! You can make this charming snack in 10 minutes--no cooking or baking required! 1. 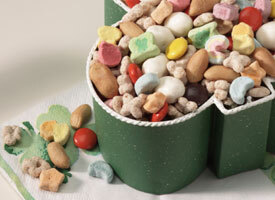 Place all ingredients in resealable plastic food-storage bag; seal. Shake until mixed. 2. Store at room temperature up to 3 days. Cookies and ice cream come together in this dreamy frozen dessert. 1. Spread 1 pint of the ice cream in pie crust. Sprinkle 1 cup of the crushed cookies over ice cream. Cover and freeze 1 hour. 2. Spread remaining pint of ice cream over cookies. Cover and freeze about 3 hours or until firm. 3. Let stand at room temperature about 10 minutes before cutting. Serve with fudge topping; sprinkle with remaining cookies. Cover and freeze any remaining pie. Get a double dose of mint! Cool mint chips flavor these brownies, and a mint-chocolate glaze generously highlights the top. 1. Heat oven to 350ºF. Grease bottom only of rectangular pan, 13x9x2 inches. .3. Stir in pecans and 1 cup of the mint-chocolate chips (set aside remaining mint-chocolate chips for Shiny Chocolate Glaze). Spread in pan. 4. Bake 28 to 30 minutes or until toothpick inserted 2 inches from side of pan comes out clean or almost clean; cool completely. 5. 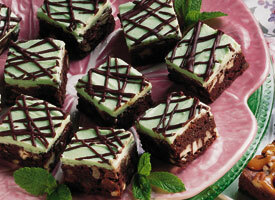 Spread Mint Frosting over brownies. Drizzle Shiny Chocolate Glaze over frosted brownies. 6. Refrigerate about 30 minutes or until glaze is firm. For 48 brownies, cut into 8 rows by 6 rows. Beat powdered sugar and butter in small bowl on low speed of electric mixer until smooth. Beat in milk, 1 tablespoon at a time, until spreadable. Beat in extract and food color. Heat mint-chocolate chips, butter and corn syrup over low heat, stirring occasionally, until melted. Stir in hot water, a few drops at a time, until mixture is thin enough to drizzle. Savory ground lamb cooks in minutes and gets a cooling, creamy topping full of Indian flavors. 2. Mix remaining ingredients. Shape mixture into 6 patties. 3. Spray 12-inch skillet with cooking spray; heat over medium heat. Cook patties in skillet 5 minutes; turn. Cook 3 to 5 minutes longer or until no longer pink in center. Serve with sauce. This rich, decadent bundt cake combines two favorite flavors. 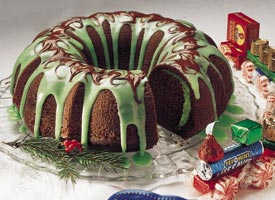 The minty glaze is-you guessed it-icing on the cake! 1. Heat oven to 350ºF. Generously grease and flour 12- cup bundt cake pan. 2. Beat cream cheese in small bowl with electric mixer on high speed until smooth and fluffy. 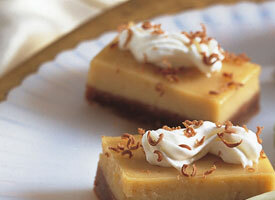 Beat in granulated sugar, 2 egg yolks, 1/8 teaspoon peppermint extract and 3 drops food color until smooth; set aside. 3. Beat cake mix, 1 1/3 cups water, the oil, 2 whole eggs and 2 egg whites in large bowl on low speed 30 seconds. Beat on medium speed 2 minutes. 4. Pour half of the batter (about 2 1/2 cups) into pan. Spoon cream cheese mixture into ring, about 1 inch wide, onto center of batter in pan. Spoon remaining batter over cream cheese mixture. 5. Bake 45 to 50 minutes or until toothpick inserted in cake comes out clean. Cool in pan 20 minutes. Turn upside down onto wire rack; remove pan. Cool completely, about 35 minutes. 6. Heat chocolate chips and shortening until melted; set aside. Mix powdered sugar, 1/4 teaspoon peppermint extract, 3 drops food color, the corn syrup and enough of the 2 to 2 1/2 teaspoons water to make a thick glaze that can be easily drizzled. Drizzle powdered sugar glaze over cake. Immediately spoon melted chocolate over glaze in 1/2-inch-wide ring. Working quickly, pull toothpick through chocolate to make swirls. Refrigerate until serving. Store covered in refrigerator. High Altitude (3500-6500 ft) Heat oven to 375ºF. Beat cheese mixture on medium-high 1 1/2 min. Stir 1/4 cup all-purpose flour into cake mix. Use 1 Tbsp oil. Pour all of batter into pan; spoon cheese mixture on batter. Swirl through batter and cheese mixture with a knife. 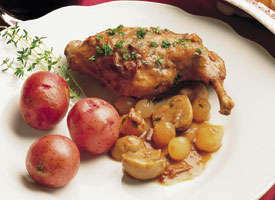 This richly flavored stewed rabbit has a special ingredient to make it tender and flavorful: Irish stout! 1. Cook bacon in 4-quart Dutch oven over medium heat, stirring occasionally, until crisp. Remove bacon with slotted spoon, reserving fat in Dutch oven, and drain on paper towels. 2. Mix flour, salt, pepper and paprika. Coat rabbit pieces with flour mixture. Heat bacon fat over medium heat. Cook rabbit in bacon fat about 15 minutes or until brown on all sides. 3. Stir in mushrooms, onions, thyme and bay leaf. Pour stout over rabbit and vegetables. Crumble reserved bacon over mixture. Heat to boiling; reduce heat. Cover and simmer about 1 hour or until thickest pieces of rabbit are tender. 4. Remove rabbit and vegetables to warm platter; keep warm. Remove bay leaf. Heat stout mixture to boiling. Mix cornstarch and water; stir into stout mixture. Boil and stir 1 minute. Pour sauce over rabbit and vegetables. Sprinkle with parsley. 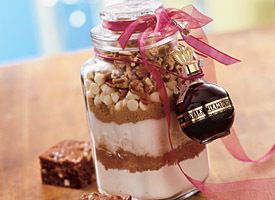 An impressive layered brownie mix makes the perfect gift from your kitchen to someone you love! 1. Layer all ingredients except liqueur in order listed in 1-quart jar with screw-on lid. Attach liqueur bottle to jar with ribbon. Heat oven to 350ºF. Grease bottom only of square pan, 8x8x2 or 9x9x2 inches, with shortening. Melt 1/2 cup butter or margarine. Beat melted butter, 2 eggs and the liqueur in medium bowl with spoon until blended. Stir in Celebration Brownie Mix. Spread batter in pan. Bake 8-inch pan 30 to 35 minutes, 9-inch pan 25 to 30 minutes, or until dry around edges and toothpick inserted in center comes out almost clean. Cool completely, about 1 hour. For brownies, cut into 4 rows by 4 rows. Makes 16 brownies. Feeling like a quick Irish adventure? 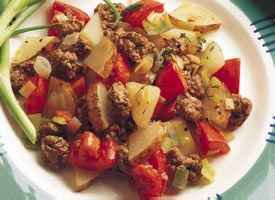 You’ll have one with this simple supper dish that combines ground lamb, leek, dill and potatoes. 1. Cook lamb, leek and garlic in 10-inch skillet over medium heat, stirring frequently, until lamb is brown; drain. 2. Stir remaining ingredients except tomatoes into lamb mixture. Heat to boiling; reduce heat. Cover and simmer about 12 minutes, stirring occasionally, until potatoes are tender. Remove bay leaf. Stir in tomatoes; heat through. 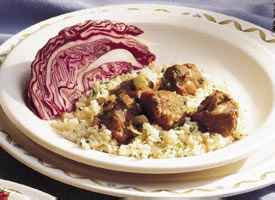 North African flavors marinate tender lamb that you grill and serve with hot cooked couscous, the wheat-grain semolina served as a grain side dish in this part of the world. 1. Remove fat from lamb. Cut lamb into 1 1/2-inch cubes. Mix remaining ingredients except couscous, mint and pepper sauce in glass or plastic bowl. Add lamb; stir to coat with marinade. Cover and refrigerate 4 hours. 2. Set oven control to broil. Spray broiler pan rack with cooking spray. Remove lamb from marinade. Place lamb on rack in broiler pan. Broil with tops 5 inches from heat 6 minutes; turn. Spoon pan drippings over lamb. Broil about 7 minutes longer or until no longer pink in center. 3. Mix couscous and mint. Serve lamb over couscous. Serve with pepper sauce.